Though not a big fan of the term “Atmospheric River”, I prefer the old school “Pineapple Express”, I’ve got to say that I’m pretty impressed on the one that we’ve got bearing down on us as I write this on Thursday afternoon. 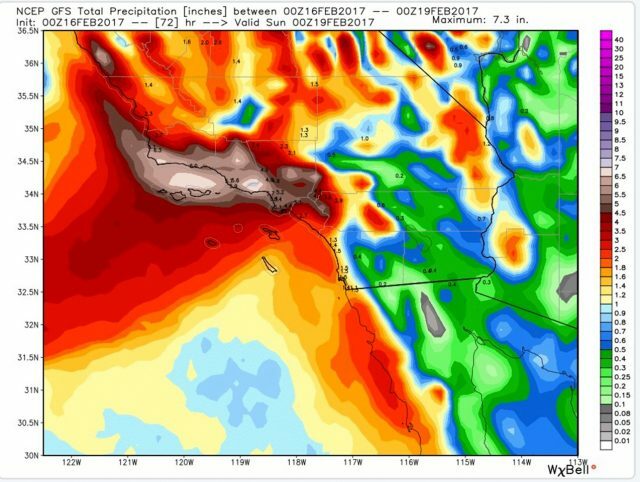 While most of the reports are calling for a couple inches of rain along the coast on Friday afternoon and evening, if this photo sent to me by my friend Chris Husband is proven correct, we might be seeing as much as 5 to 7-inches along parts of the Ventura coast. There’s also some serious wind associated with this event, enough so that the Coast Guard has issued warnings to all marinas of damaging winds. 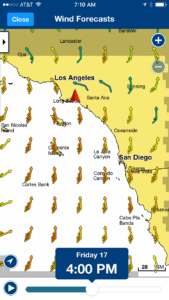 According to my Navionics Boating App, 4:00 p.m. on Friday will bring sustained 35-MPH winds to our coastal waters and NOAA is forecasting gusts over 50-MPH. I think it goes without saying but if you were considering being on the water for any other reason to adding lines to you boat in the slip, don’t even think about it. South wind of that velocity will not just make conditions unfishable but will very likely end your life. The good news regarding the wind is that while it’s going to blow very hard it’s not going to do it for a very long time. The wind is supposed to come up around 10 a.m. and by midnight it’s supposed to be light and variable. The rain will also taper off early on Saturday morning giving way to cloudy skies and horrible fishing conditions. 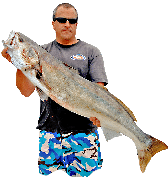 Speaking of horrible fishing conditions, immediately following what’s being called the biggest rain storm in 10 or 20 years, I will be fishing the first event of the 2017 SWBA tournament season in Long Beach Harbor on Saturday morning. The fishing has actually been pretty good in the harbor the last couple weeks, but I’m sure that will change dramatically due to the millions of gallons of freshwater run off that will make their way into the harbor overnight. Regardless of how the tournament goes, I will be talking about it as part of a seminar panel at the Pacific Coast Sportfishing show at 10:30 a.m. on Sunday, so if you make it to the show please stop by and say hello. The fishing is going to be horrible everywhere this weekend so my advice to you is that unless you’re fishing this tournament, just stay home. To end this storm shortened report on a bright note, this picture shows the 104-pound bluefin caught earlier this week aboard the Excel on their way home from a long range trip. 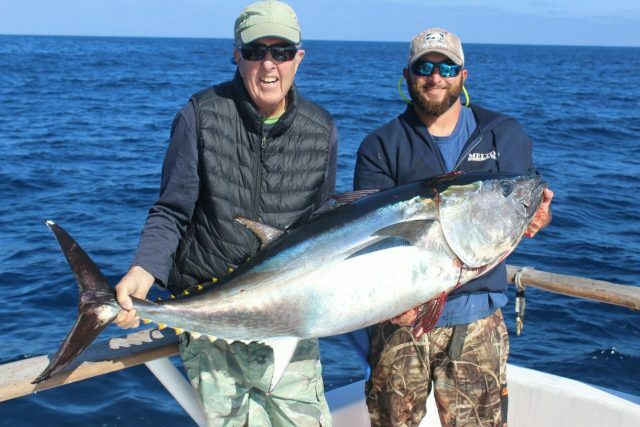 There have been rumors of other spots of fish being seen and caught over the last couple weeks, so if we can get the weather to lay off for a couple weeks we might be treated to some early season bluefin. Be careful on the roads on Friday and even more careful on the water if you decide to give it a shot on Saturday or Sunday.